On Friday at 12:25 a.m. EDT, NASA’s newest spacecraft, Juno, launched into orbit from Cape Canaveral, Florida, on its way to Jupiter. Juno will engage in an analysis of the planet from an orbit around it. Juno Spacecraft in front of jupiter. Researchers hope that the spacecraft and its myriad of instruments will shed light on the origins of Jupiter. Furthermore, being the largest and oldest planet in the solar system, scientists believe that Jupiter may also hold clues to the formation and evolution of the early solar system. Additionally, the data gathered from Juno may help scientists to understand early planetary processes occurring in other star systems beyond our own. Juno will travel roughly 1,740 million miles (2,800 million kilometers) over the course of its five-year journey. Recent observations of comet Hartley 2 have scientists scratching their heads, while they anticipate a flyby of the small, icy world on Nov. 4. A phenomenon was recorded by imagers aboard NASA’s Deep Impact spacecraft from Sept. 9 to 17 during pre-planned scientific observations of the comet. These observations, when coupled with expected images during the closest encounter with Hartley 2 on Nov. 4, will become the most detailed look yet at a comet’s activity during its pass through the inner-solar system. The new phenomenon is very unlike typical cometary outbursts, which have sudden onsets and are usually accompanied by considerable dust. It also seems unrelated to the cyanide jets that are sometimes seen in comets. The EPOXI science team believes that astronomers and interested observers viewing the comet from Earth should be aware of this type of activity when planning observations and interpreting their data. “If observers monitoring Hartley 2 do not take into account this new phenomenon, they could easily get the wrong picture of how the comet is changing as it approaches and recedes from the sun,” said A’Hearn. Cyanide is a carbon-based molecule. It is believed that billions of years ago, a bombardment of comets carried cyanide and other building blocks of life to Earth. NASA’s Jet Propulsion Laboratory, Pasadena, Calif., manages the EPOXI mission for NASA’s Science Mission Directorate, Washington. The University of Maryland, College Park, is home to the mission’s principal investigator, Michael A’Hearn. Drake Deming of NASA’s Goddard Space Flight Center, Greenbelt, Md., is the science lead for the mission’s extrasolar planet observations. The spacecraft was built for NASA by Ball Aerospace & Technologies Corp., Boulder, Colo. 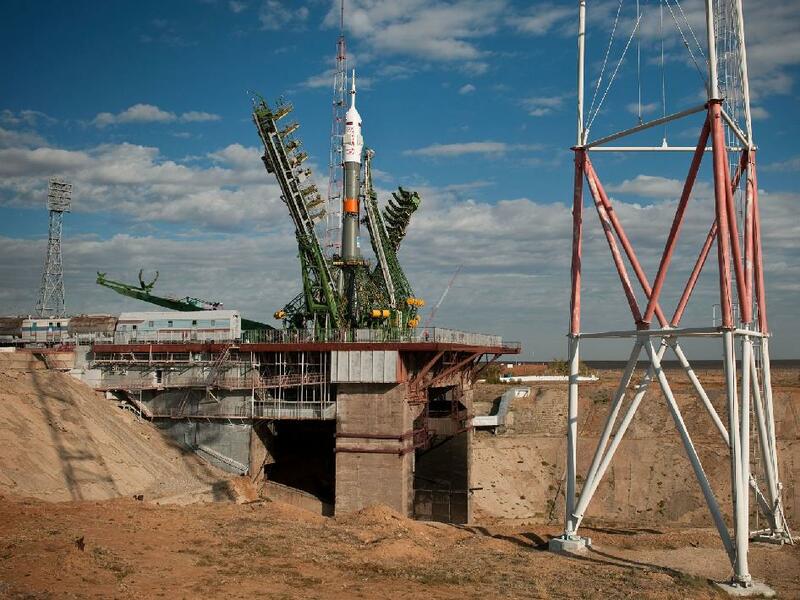 The Soyuz spacecraft that will carry three new Expedition 25 flight engineers to the International Space Station was rolled out to the launch pad at the Baikonur Cosmodrome in Kazakhstan on Tuesday. NASA astronaut Scott Kelly and Russian cosmonauts Alexander Kaleri and Oleg Skripochka will launch aboard the new Soyuz TMA-01M Thursday at 7:10 p.m. EDT (Friday, Kazakhstan time) and begin a five-month tour of duty aboard the station after docking to the Poisk module Saturday evening. Meanwhile, the three Expedition 25 crew members already living and working aboard the station conducted a depressurization drill, collected data for science research and prepared for the installation of a device to produce water. Commander Doug Wheelock began his workday early by participating in the Pro K experiment, which studies dietary countermeasures to lessen the bone loss experienced by astronauts during long-duration spaceflight. With assistance from Flight Engineer Shannon Walker, Wheelock collected a blood sample and stored it in the Minus Eighty-Degree Laboratory Freezer for ISS for study later by scientists back on Earth. Walker spent much of her morning with the Capillary Flow Experiment for an investigation of capillary flows and flows of fluids in containers with complex geometries. Results of this study will improve current computer models used by designers of low-gravity fluid systems and may improve fluid transfer systems on future spacecraft. Later Yurchikhin joined Wheelock and Walker for an emergency drill to sharpen the crew’s response to a rapid, unexpected loss of cabin pressure within the station. Afterward the three tagged up with flight controllers for a debrief of the drill. After a break for lunch, Wheelock used a ham radio to speak with students at the Institute of Research and Education in Italy and answered a variety of questions about life aboard the space station. Wheelock then tagged up with flight controllers to discuss the upcoming installation of the Sabatier, which combines carbon dioxide from the Carbon Dioxide Removal Assembly and hydrogen from the Oxygen Generation System to form water and methane. The water will be recycled by the Water Processor Assembly, and the methane vented overboard. 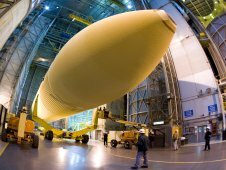 Commemorating 37 years of successful tank deliveries, NASA and Lockheed Martin Space Systems Company will hold a ceremony on Thursday, July 8, at the agency’s Michoud Assembly Facility in New Orleans to rollout the final external tank for the last space shuttle flight. The last external tank scheduled to fly on a shuttle mission was completed on June 25 by Lockheed Martin workers at Michoud. The tank, designated ET-138, will travel on a wheeled transporter one mile to the Michoud barge dock. It will be accompanied by the Storyville Stompers, a traditional area brass band, and hundreds of handkerchief-waving employees in typical New Orleans fashion and spirit during the ceremony. ET-138 will then travel on a 900-mile sea journey to NASA’s Kennedy Space Center in Florida, where it will support shuttle Endeavour’s STS-134 launch. The external tank, the “gas tank” for the orbiter, holds the propellants used by the space shuttle main engines. It also is the “backbone” of the shuttle during launch, providing structural support for attachment with the solid rocket boosters and orbiter. It is the only component of the space shuttle that is not reused. Approximately 8.5 minutes into the flight, with its propellant used, the tank is jettisoned into the ocean. Taller than a 15-story building and more than 27 feet in diameter, the external tank absorbs the 7.8 million pounds of thrust of the three space shuttle main engines and solid rocket boosters during a space shuttle launch. It feeds 145,000 gallons of liquid oxygen and 390,000 gallons of liquid hydrogen to the main engines. The three main components of the external tank include the liquid oxygen tank, liquid hydrogen tank and the collar-like intertank, which connects the two propellant tanks. The intertank houses instrumentation and processing equipment and provides the attachment structure for the solid rocket boosters. When ET-138 arrives at Kennedy, processing will begin to mate it with shuttle Endeavour and solid rocket boosters for the STS-134 mission, scheduled to launch no earlier than mid-November. The mission will deliver the Express Logistics Carrier 3 and the Alpha Magnetic Spectrometer to the International Space Station. 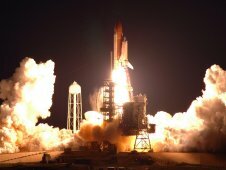 It will be the 36th shuttle mission to the space station and the 134th and final scheduled shuttle flight. Michoud Space Systems workers, of Lockheed Martin Corporation, Littleton, Colo., have delivered 135 flight tanks to NASA during the 25 years of flying the space shuttle. Work will be completed on one additional external tank, ET-122, which was at Michoud during Hurricane Katrina in August 2005 and damaged by falling debris. It is being restored to flight configuration and is scheduled for delivery to Kennedy in late September to serve as the “Launch on Need” tank, if needed, for STS-134. PASADENA, Calif. — Data from NASA’s Mars Reconnaissance Orbiter (MRO) have helped scientists solve a pair of mysteries dating back four decades and provided new information about climate change on the Red Planet. 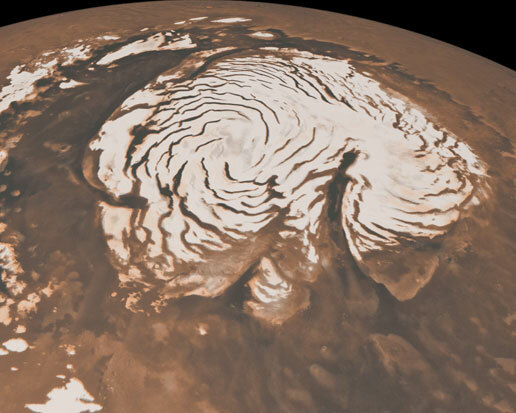 The Shallow Radar, or SHARAD, instrument aboard MRO revealed subsurface geology allowing scientists to reconstruct the formation of a large chasm and a series of spiral troughs on the northern ice cap of Mars. The findings appear in two papers in the May 27 issue of the journal Nature. “SHARAD is giving us a beautifully detailed view of ice deposits, whether at the poles or buried in mid-latitudes, as they changed on Mars over the last few million years,” said Rich Zurek, MRO project scientist at NASA’s Jet Propulsion Laboratory in Pasadena, Calif.
On Earth, large ice sheets are shaped mainly by ice flow. According to this latest research, other forces have shaped, and continue to shape, polar ice caps on Mars. The northern ice cap is a stack of ice and dust layers up to two miles deep, covering an area slightly larger than Texas. Analyzing radar data on a computer, scientists can peel back the layers like an onion to reveal how the ice cap evolved over time. One of the most distinctive features of the northern ice cap is Chasma Boreale, a canyon about as long as Earth’s Grand Canyon but deeper and wider. Some scientists believe Chasma Boreale was created when volcanic heat melted the bottom of the ice sheet and triggered a catastrophic flood. Others suggest strong polar winds carved the canyon out of a dome of ice. Other enigmatic features of the ice cap are troughs that spiral outward from the center like a gigantic pinwheel. Since the troughs were discovered in 1972, scientists have proposed several hypotheses about how they formed. Perhaps as Mars spins, ice closer to the poles moves slower than ice farther away, causing the semi-fluid ice to crack. Perhaps, as one mathematical model suggests, increased solar heating in certain areas and lateral heat conduction could cause the troughs to assemble. Data from Mars now points to both the canyon and spiral troughs being created and shaped primarily by wind. Rather than being cut into existing ice very recently, the features formed over millions of years as the ice sheet grew. By influencing wind patterns, the shape of underlying, older ice controlled where and how the features grew. The Mars Reconnaissance Orbiter was launched on Aug. 12, 2005. SHARAD and the spacecraft’s five other instruments began science operations in November 2006. The MRO mission is managed by JPL for the Mars Exploration Program at NASA’s Headquarters in Washington. SHARAD was provided by the Italian Space Agency, and its operations are led by the InfoCom Department, University of Rome.